Everyone deals with incidents in their own way. At a recent networking event I was speaking with a manager whose main responsibility was to manage the incident process from escalation to resolution. During the conversation he explained that they managed it much like a medical triage. Since I must have had a somewhat confused look on my face he outlined that in a past career he worked in a medical center and that this triage seemed similar since his organization was dealing with a multitude of incidents every day (I will get back to that). He said, "You probably already manage your incidents in a much similar way, but let me break it down for you in this way." Like an emergency room, escalations will come into the service desk and we need to identify which one of the incidents needs to be managed first. We need to assess which incident has the most immediate need for restoration based on severity and impact. In a medical sense this might be represented by a red tag. The red tag symbolizes those who cannot survive without immediate treatment but have a chance of survival. In this organization they treat critical applications as priority 1 incidents and are managed by all available resources. After this assessment the triage identifies what incidents are not immediate but will need to be addressed once the resources are no longer working on the priority 1 incident. 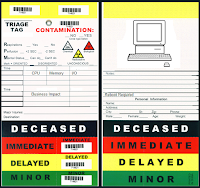 Much like a medical yellow tag these patients are not in immediate danger of death but do require attention. Lastly, he explained that there were also escalations which were low on the priority scale. These 'walking wounded' or green tags would represent issues that would get looked at after all other issues were addressed or might have had a workaround that would get them by. From a continual service improvement perspective it might be time to take a look at the bigger picture and see where the support teams may be spinning their wheels. In this particular scenario the manager indicated that this might be impossible since all hands are on deck every day. The focus of improving the customer experience clearly needs to be changed from a reactive to a proactive perspective. This means we need to STOP, think, and re-focus on how we are providing the support. From the business angle we can all agree that while issues are addressed quickly they would really rather not have to deal with them at all. 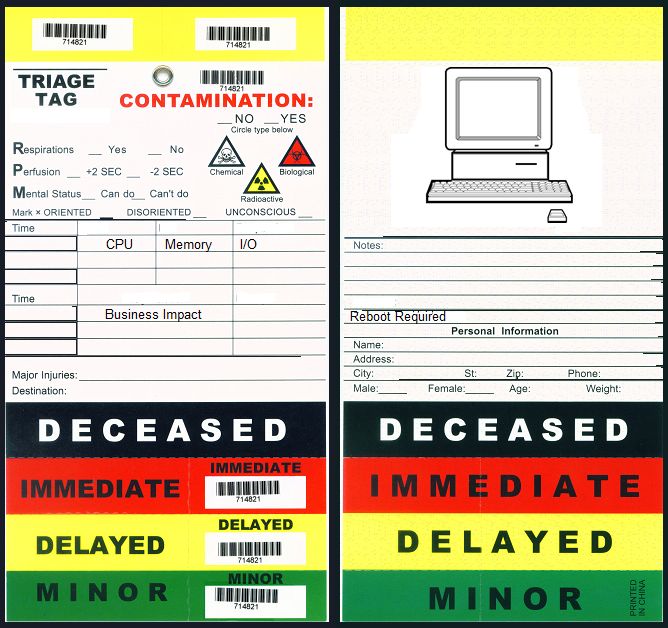 Some time and effort must be taken to see what recent issues are in the green, yellow and red tags before the IT department becomes a black tag.